Energy breakfast at its best. Fry the tomato and onion together, add the sugar, cloves of garlic, ginger, vinegar, Worcester sauce and chili. Cover and simmer for five minutes. 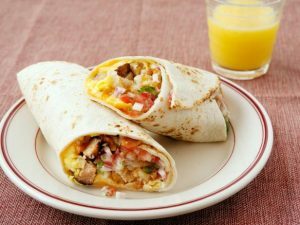 Heat the wraps in the microwave oven for 30 seconds. Stir the eggs and milk together in a pan over low heat. Fry the scrambled eggs together with the spring onions, chives, bell pepper, mushroom, salt and pepper until done. Place the scrambled egg mixture on the wrap and top off with the avocado pear. Sprinkle the spinach and basil leaves over the avocado pear. Spoon the tomato sauce on top and fold the wrap over or enjoy it open.